Welcome to the March Nano Bite, the monthly e-newsletter for the Nanoscale Informal Science Education Network (NISE Net) and community. The Nanoscale Informal Science Education (NISE) Network is transitioning to a new, ongoing identity as the National Informal STEM Education (NISE) Network. As part of this new transition, the Network is redesigning the NISE Network logo to reflect our evolution beyond nano, expanding to topics around synthetic biology, earth and space, sustainability, and more. You'll see the new design roll out across the newsletter, website, and products soon! → Building with Biology physical kits have been awarded for Summer 2016 Events! Building with Biology physical kits have been awarded to over 150 organizations across the U.S. who will participate in Summer 2016 Building with Biology Events. It's great to see so many new Network partners apply for a kit and for all to get involved in engaging the public in this new subject area (see list of kit recipients). A digital version of the physical kit will also be available for download online in late May. If you're a scientist or member of the synthetic biology community who is interested in volunteering at a local event, please submit an expression of interest form in order to be connected with a host site near you. → Did you receive your Explore Science Kit-Zoom into Nano physical kit? If you were awarded an Explore Science-Zoom into Nano kit for use in the Museum & Community Partnerships project, your kit (shipped in two separate boxes) should have arrived! Museum partners and your collaborative youth-serving and/or community organization partner should be planning to implement your program activities sometime this spring and summer. Additionally, a digital version of the Explore Science-Zoom into Nano kit is available for download online at http://www.nisenet.org/explorescience-nano. Pilot activities for the sustainABLE activity kits were tested at the 2016 Sustainability Solutions Festival Family Day at Arizona Science Center. See photos from the event here. We recently shared posters and presentations at the Center for Advancement of Informal Stem Education (CAISE) 2016 National Science Foundation (NSF) Advancing Informal STEM Learning (AISL) Program Principal Investigator (PI) Meeting in Maryland. See pictures and project posters presented at the meeting here. NanoDays 2016 nationwide events are taking place March 26th through April 3rd. Although the NISE Network is no longer creating and distributing new NanoDays kits, we encourage all our partners to continue to hold NanoDays events and use NanoDays materials year-round (and remember no reporting this year!). You can download digital kit materials from the 2015 kit as well as other prior kits to supplement past kits. Support the Network in continuing to reach one million people annually through NanoDays events and NanoDays kit use throughout the year. Share your NanoDays activities and photos with the Network through social media by using #NanoDays #nisenet. Getting ready for the summer of 2015, KidsQuest Children's Museum located in Bellevue, Washington was looking for more ways to increase community access to our education programs. After a decade of serving our community, we know that Bellevue families like to be outside in the summer, so we looked to parks! 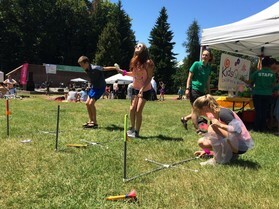 Thanks to a mini-grant from the NISE Network we were able to send our educators to different parks in the community with free hands-on nano science activities for families in the community...The parks included a wide variety of attractions such as a splash park and an amphitheater that attract families from all over. shown in small scale nano science experiments. For example, to go with moving molecules exploration we brought out our stomp rockets, and to help illustrate surface tension we also brought large building sticks and fabrics to build geometric structures. These larger activities were a great opportunity for gross motor movement in the outdoor space, as well as a great connection to the scientific concept shown in our smaller experiments. The program was a great success and we saw approximately 585 visitors over six events during the summer of 2015. This met our goal of increasing program access as well as helping us educate those visitors on new nanotechnologies...At these events families were delighted to have hands on science activities and felt that it added to their overall experience. We also scheduled several "pop up" events where our educator would bring activities for whomever happened to be at the park. Continue reading the full Partner Highlight to read more about how the Science in the Park program has positively impacted the community and how the program is continuing to grow. Building with Biology is one of several projects that extends the Network into the its new identity as the National Informal STEM Education Network by addressing new content areas, such as synthetic biology. This project also focuses on fostering public engagement in science by having scientist volunteers interact and have discussions with the public through hands-on activities and forums. The Building with Biology Evaluation Team has released its report about the eight Building with Biology pilot events in 2015. Each of these sites helped evaluators gather survey data from the public, volunteers, and forum participants. The surveys investigated what participants learned and valued, and how participation increased interest in synthetic biology and related follow-up behaviors. These data will be used to help understand the impacts of the project and inform changes for summer 2016 activities and events. Visitors enjoyed the Building with Biology events. Visitors of many ages, genders and group types found the events enjoyable. Forum and event participants learned about synthetic biology. This included facts about synthetic biology, applications of synthetic biology, what others think about synthetic biology, and other learning. Forum and event attendees valued different things about their experiences. Forum attendees primarily valued two-way discussions while event attendees valued learning from experts. The events increased participants' interest in future activities related to synthetic biology. This included learning more about synthetic biology, using synthetic biology products, and discussing synthetic biology with others. Volunteers gained skills and interest in public engagement with science. They also learned about the public's interests and knowledge about synthetic biology. Continue reading the full blog post to learn more about these findings from the Building with Biology public events. Scientists increasingly understand why it's important to talk to the public, but listening to the public is also important. The Flint Water Study, a citizen science project run by faculty and their students at Virginia Tech provides a timely example. Through this study, residents in Flint, MI can follow simple protocol to collect tap water samples in their home, ship it to Virginia Tech, and receive results about the water chemistry. This project began when an engineering professor received a phone call from a concerned resident in Flint - and he didn't turn a deaf ear. Nucleic acids consist of chains or sequences of bases consisting of a few to millions of elements long, and based on their pattern are indicative of their function inside inside cells and tissue. Researchers at Wake Forest Baptist Medical Center have developed nanosensors that can determine whether a specific target nucleic acid sequence exists within a mixture, and if present forms a double helix to provide a clear signal. By counting the number of signals, one can determine how much of the target is present. The team of researchers have applied this nanotechnology technique to one particular microRNA (a family of nucleic acids) known to indicate lung cancer in humans. Next steps are to expand this technology to study clinical samples of blood, tissue or urine. In a first, the UK has granted approval for scientists to genetically modify human embryos to study life at its earliest stages. In this study, scientists will be altering genes in donated embryos, which will be destroyed after seven days, to learn more about the genes needed for a human embryo to develop successfully into a healthy baby. Miscarriages and infertility are extremely common but not very well understood; through this research scientists will be able to better understand what genes are guiding early development. Entrepreneurs in Calgary, Canada have developed FRED, the Field-Ready Electrochemical Detector, which involves genetically engineered bacteria capable of sensing a variety of water-borne contaminants and in response to detection emits a chemical that is electroactive. The electrical signal indicates the level of contamination and could be used in field sites to test water near mining sites, water treatment plants or landfills. With the World Health Organization recently declaring Zika a "public health emergency of international concern," scientists are quickly working to find a solution to this growing problem. In addition to the traditional deterrents of insecticides and mosquito nets, scientists are turning to emerging technologies such as synthetic biology for solutions, including genetically engineering mosquitoes who's offspring inherit a trait that cause the mosquito to die before reaching maturity, producing "smart vaccines" that can be rapidly designed digitally and programmed to produce molecules that trigger an immune response, and gene drives that propagate specific traits through an entire mosquito population.